DOUBLE DRIBBLE (NES, 1-2 players, rated E for Everyone, 500 Wii Points): DOUBLE DRIBBLE, the first 5-on-5, full-court home basketball game, is pure hoops action at its finest. While still a surprisingly accurate basketball game for its time, the frantic action keeps you on your toes as your players run from one end of the court to the other. Choose from a handful of teams and multiple levels of difficulty as you take on the computer alone or challenge a friend and see who has the better skills. Take the ball and sink shots from locations all over the court, or get in your opponent’s face and do your best to block the shot. Better yet, drive the lane and rock the rim to see one of the game’s trademark slam-dunk cut scenes. He shoots, he scores! 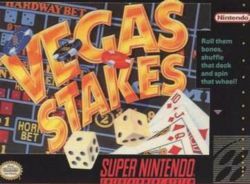 Vegas Stakes (Super NES, 1-4 players, rated E for Everyone – Simulated Gambling, 800 Wii Points): Feel like taking a road trip to Las Vegas? Let your inner high roller go wild as you try your luck at five different games-blackjack, slots, poker, craps and roulette. Start with only $1,000 in your pocket and play your way through five casinos, each with a different theme and varying limits. But no one wants to gamble alone, right? Not a problem, as you’ll be able to choose one of four friends to tag along and offer advice when you need it. Further enhancing the experience is the fact that you’ll be presented with a slew of interactions with random casino patrons. Best be careful, though-your choices in these situations could either get you closer to the millions of dollars you’re after or cost you a pile of that hard-earned cash. Roll the dice, spin the wheel, hit or stand-do whatever it takes to stake your claim in Vegas and beat the house! Ecco Jr. (Sega Genesis, 1 player, rated E for Everyone, 800 Wii Points): The aquatic adventures of Ecco come to life for a younger generation of gamers. Perfect for kids, Ecco Jr. finds our young hero heading out to sea with a variety of tasks he must perform in order to get there. Along with his friends Tara the baby orca and Kitnee the young Atlantic dolphin, Ecco Jr. will interact with sea lions, sea horses and other aquatic life as he makes his journey to the Big Blue. Introduce your kids to the classic series of Ecco the Dolphin titles by downloading Ecco Jr. today.